There are still 22 games left this year, but the Red Sox season has been over for some time now. It's just a matter of seeing how top prospects fit in to the Sox at this point, with a focus on who could be an impact player in 2015. But beyond that, the Sox are going to have to make some moves if they want to be contenders in 2015. The primary area of concern right now is pitching. One, they need an ace. Or 2. They need to make a serious push for Jon Lester or a Cole Hamels. As I wrote last week, the Sox need an ace to anchor the top of the rotation, whether that be Lester, Hamels, or someone else. Or some combo of the 3. And it's not just starting pitching, but the bullpen as well. Specifically, closer. As much as I love Koji, he's been pretty bad as of late. And he's getting up there in age. He'll be 40 next year, and he's no Mariano Rivera, who was an effective closer until he retired last year at age 43. As hard as it is to say, it's time to move from Koji and get a younger arm to close out games. Another big concern for me is getting a bat. Acquiring Yoenis Cespedes at the deadline was a good move, but the Red Sox need another bat because David Ortiz will retire soon and Mike Napoli hasn't been the same guy he was last year. Napoli could bounce back next season, but Ortiz can't reverse the hands of time. 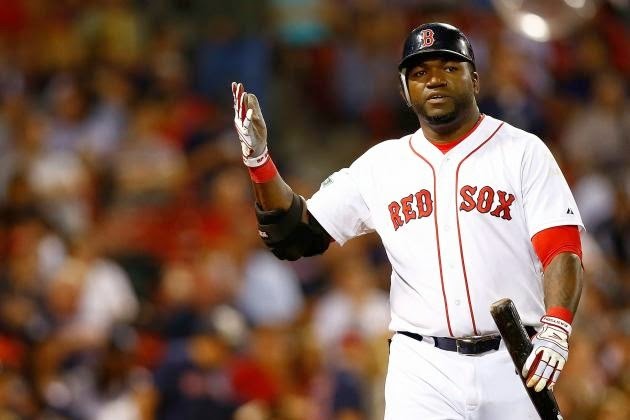 Ortiz has been one of the few bright spots this year, with 32 home runs and 98 RBI's, but he can't keep it up forever. The Red Sox need to go after a big bat to give him some support in the lineup. I may be fueling an empty fire her, but if the Sox can bring Lester back, then they could go after Miami's Giancarlo Stanton, but I don't know how likely that actually is. The last main concern for meis 3rd base. Will Middlebrooks has been struggling, hitting at a .180 clip and a .973 fielding percentage, which isn't bad, but still leaves something to be desired. The Sox tried Xander Bogaerts at 3rd, and it's clear he's not comfortable at 3rd, with a .910 fielding percentage in 44 games. You could always put Brock Holt there, but he's made 6 errors in 38 games at 3rd, so I think he'd be much better served as a utility infielder/outfielder. Granted, the Sox have a lot of problems, but those are the 3 big ones they need to fix if they want to get back into contention next year. Thoughts? Let me know! Leave a comment or tweet me (@C_Frederick1016). Like what you read? Now's your chance to get in on the action. We're looking for new writers! Email me at conor1016@gmail.com with a Sox themed sample!